During our March meeting, Sherri from the Sherri’s Project Wounded Warrior Pack, came out from Oceanside and gave the DRA members a demonstration of what her non profit organization is all about. We were truly inspired. Sherri’s nonprofit organization specialize in locating and matching suitable dogs, from rescues and Humane Societies across the United States, to combat wounded, disabled, or injured veterans who would benefit from a Service Dog in the San Diego area. 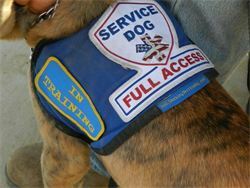 The DRA is proud to say, we will be sponsoring several service dogs for wounded vets! As we start this new project with Sherri we will keep you posted of the process and progress. Thank you to Sherri and her pack for coming out and thank you to the DRA members for getting behind such a worthy project. Check out, Sherri’s Project: Wounded Warrior Pack’s website for more information.